A handsome flint church, mostly rebuilt by G E Street, retaining late C12 arcades and a C13 doorway. 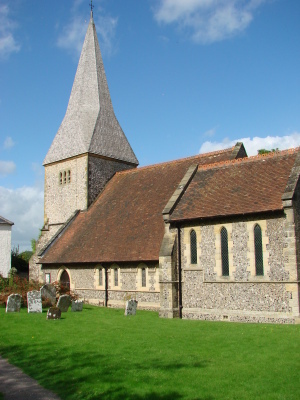 Graffham church stands on the slope of the Downs at the southern end of the village. 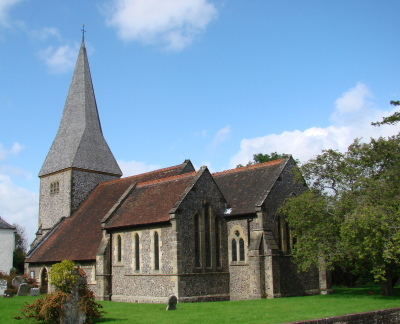 Manor and living are linked with the estate of East Lavington, which was inherited through his wife by Samuel Wilberforce (1805-73), successively Bishop of Oxford and Winchester and a great figure in the mid-Victorian church. He was killed by a fall from his horse and Graffham church was rebuilt as a memorial in 1874-75, at a cost of £2885 (KD 1899). The architect was G E Street (SAC 88 pp162-65), who had been associated with Wilberforce in the diocese of Oxford and had made plans for rebuilding in 1857 (ibid p162), though only a lychgate (no longer extant) was completed. The Sharpe Collection drawing (1804) shows a shorter church with dormers. Apart from a C14 east window, most of those shown by Adelaide Tracy (1849) (I p108) are lancets. 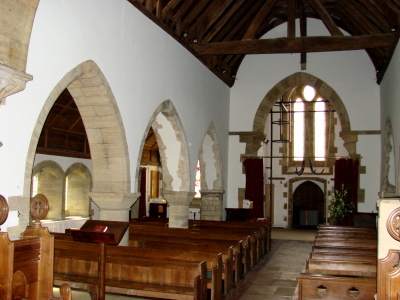 The church is mentioned in Domesday Book (11, 17) and Street retained the late C12 two-bay arcades, though he added a third, smaller arch at each eastern end. They are typical of the period with round piers on water-holding bases and square plinths, with large and varied scallop capitals. The square west responds have plain abaci and, like the heads, are slightly chamfered. The tiebeam roof of the western nave and the walling are also old, the latter at least probably of the same date as the arcades. The quality of craftsmanship is high, both inside and out; the exterior is faced with unusually dark and superbly knapped flintwork and the stonework is hand-chiselled, avoiding the monotony of much C19 stonework which was machine-cut. Street extended the nave to the east, so the chancel, south chapel and north vestry are entirely his work. 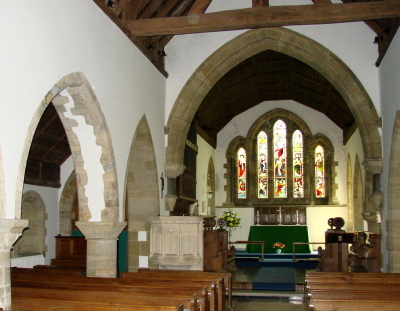 Viewed from the east, there is a fine composition of lancets, five in the chancel with a shafted rere-arch and three in the chapel. The other windows are either lancets or have plate tracery. In addition to the third arches of the arcades, the chancel arch is entirely by Street and it has short marble shafts. The arcade to the south chapel derives from the nave arcades. 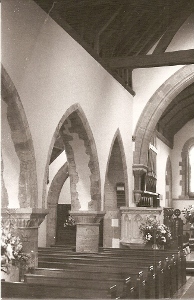 The east lancets of the chapel are separated by buttress-like divisions, sloped at the tops, whilst the rere-arches of the chancel ones have small arches for the sides and a big one surrounding the centre three. 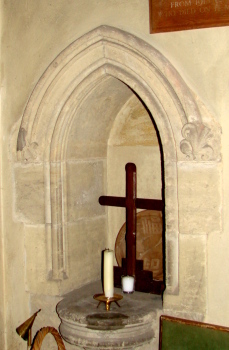 A C15 four-centred doorway into the vestry is reset from the old church, though its position there is not known. Street kept the C13 tower, but ten years later it was declared unsafe, possibly as a consequence of the rebuilding. Street was dead and in 1885, according to an inscription inside, his son, A E Street, built a new one (also in B 50 p668) in lighter and rougher flintwork with triple-lancet openings and a big broach spire, which was added in 1889. He reset the weathered C13 west doorway, its moulded head on thin shafts with disproportionately large capitals, but everything else is new, including the tower arch. Door: (Vestry) C15 with a contemporary lock, decorated with two small heads, which is best seen from the vestry side. Font: Plain C12 tub, similar to others in the area. 1. (Aisles) Original C19 monochrome. 2. (East window, South chapel east window and south aisle west window) Clayton and Bell, 1875 (www.stainedglassrecords.org retrieved on 4/2/2013). Panelling: (Behind altar in place of a reredos) Simple C17 and presumably re-used. Piscina: (Vestry) Described in BE as ‘elegant mid-C13’ (p231), it is certainly elegant, but its present condition, equally certainly, is C19. Furthermore, its position cannot be the original one.